Young Anglo-Nigerian forward Nathan Delfouneso is one of seven Aston Villa players that could be selected for the London 2012 Summer Games, the Birmingham Mail has revealed. The 21-year-old England youth international has already received a letter from England gaffer Stuart Pearce notifying him of his inclusion in the preliminary squad. Players picked for the Olympics are not expected to take part in the European Championship holding in Poland and Ukraine. 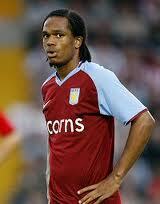 Following the arrival of Robbie Keane to Villa Park, Delfouneso, a product of the Aston Villa Academy, was sent on loan to Leicester City in the winter market. Delfouneso, who is eligible to play for Nigeria, has scored 17 goals in 48 appearances for England's youth teams.